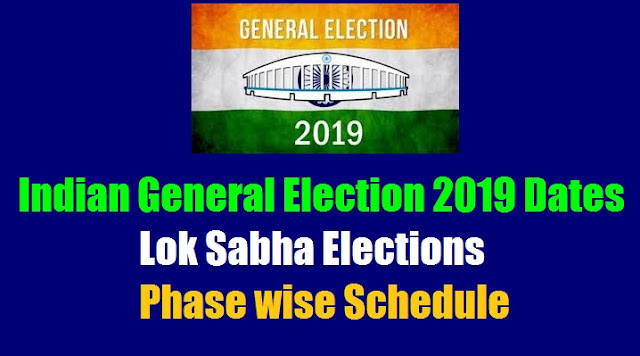 Indian General Election 2019 Dates, Lok Sabha Schedule- Election to be held in 7 phases, results to be declared on May 23 Lok Sabha Elections Phase wise schedule: : Lok Sabha Election 2019 Date LIVE UPDATES: General Elections Dates DECLARED by Election Commission, Assembly Polls Schedule out . The dates for national election announced by the Election Commission this evening at 5 pm, signaling the start of a gigantic voting exercise that will see Prime Minister Narendra Modi seeking another term in office and the opposition attempting to join forces to put up a strong fight. The Indian general elections, 2019 are to be held in April and May 2019 to constitute the 17th Lok Sabha. Legislative Assembly elections in the states of Andhra Pradesh, Arunachal Pradesh, Odisha, Sikkim and Jammu and Kashmir will be held simultaneously with the general elections. Lok Sabha elections will begin on April 11 and will be held over seven phases followed by counting of votes on May 23, the Election Commission announced today. Chief Election Commissioner Sunil Arora said the model code of conduct would come into immediate effect from Sunday and 10 lakhs polling stations would be set up this time. detailed schedule here. Lok Sabha Election Dates, Schedule 2019 LIVE updates: The Model Code of Conduct (MCC) comes into effect from today itself in the entire country. Any violation will be dealt with in the strictest manner, says Chief Election Commissioner Sunil Arora. 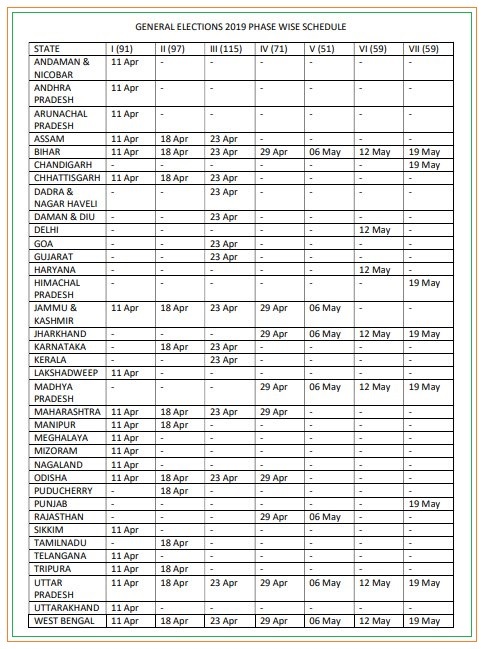 Election Commission today announced General Elections Dates, Assembly Polls Schedule. Elections will start from April 11 and counting on 23rd May. Elections will be held in seven phases. Throughout the day, all eyes were on the Election Commission (EC) of India. The EC announced the date for General Elections 2019 in New Delhi. The Election commission was earlier also expected to announce the Assembly Elections Dates for four states, where polls will be likely held simultaneously along with the Lok Sabha, say sources. Some reports had earlier said that the poll panel may announce the dates of the crucial polls over the weekends, maybe even today, or early next week. The elections are likely to be held in multiple phases. The Election Commission is said to have finalised details of the polls and also concluded preparatory meetings. Once the poll dates are announced, the Model Code of Conduct will come into force. The Election Commission on Saturday convened a meeting to assess preparedness for the Lok Sabha elections. In the meeting, polls in Jammu and Kashmir was also reportedly discussed. For all election date-related updates check here. This section will be updated once the election commission announces the final schedule of the General Elections. Lok Sabha ELection Counting of all phases on 23rd May. The previous general election was held for 16th Lok Sabha in April–May month of 2014 which was won by National Democratic Alliance (NDA) led by Bharatiya Janata Party (BJP) under the leadership of the current Prime Minister Narendra Modi by defeating the United Progressive Alliance (UPA) led by Indian National Congress (Congress). In the previous general election Bharatiya Janata Party (BJP) gained 282 parliamentary seats and Indian National Congress (Congress) gained 44. Earlier there were speculations that the Modi Government might prepone the 2019 general elections to counter the anti-incumbency factor, however learning from its past blunder of preponing election made by Vajpayee Government it decided to go into election as per the normal schedule which is likely to be announced by Election Commission of India (ECI) in the second week of March 2019.